This post contains affiliate links. That means if you click through and make a purchase, I may receive a small commission, which helps me keep the lights on around here. I appreciate you visiting so much! See disclosure for more information. 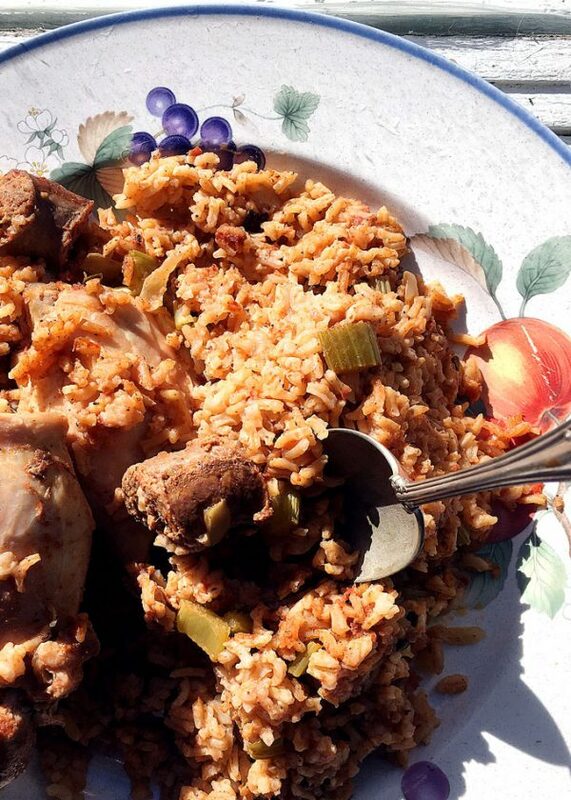 Jambalaya, made with andouille and chicken thighs was the best thing I cooked in June. The jambalaya recipe is from Virginia Willis’ new cookbook Secrets of the Southern Table: A Food Lover’s Tour of the Global South. I have a handful of jambalaya recipes because I adore it so. And what’s not to adore? Spicy rice, a bit of vegetable and multiple kinds of meat and/or seafood. It’s manna from heaven I tell you. This month I used a recipe from Virginia Willis’ new cookbook, Secrets of the Southern Table: A Food Lover’s Tour of the Global South. So, in my continuing efforts to improve my food photography and scene styling technique, I’ve started reading Helene Dujardin’s Plate to Pixel: Digital Food Photography and Styling. I’ve just started the second chapter so it’s too early to tell you my thoughts. I haven’t included a link because the book is out of print. There are a few used copies floating around. I ordered my copy from a new to me bookstore called The Strand, in New York City. The Strand is not paying me to say this but I was very impressed with the service and value. Amazon wanted nearly twice as much for Dujardin’s book. Even though I had to pay for shipping, the book was still $15 less than if I’d ordered it from Amazon. The packaging was festive and when I called with a question, the customer service rep was courteous. I’ve been watching my sweet peas blossom. They are so fragrant. This year I’m growing Spencer and April in Paris. 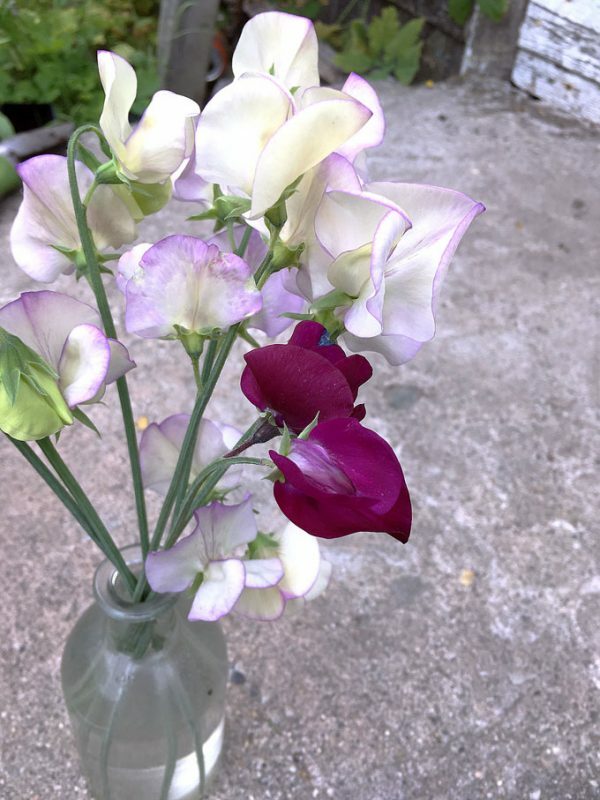 Sweet peas tend to be highly fragrant but the April in Paris is knocking my socks off. That variety smells like what I imagine a French perfume shop might. June Lifestyle Favorites include a new jambalaya recipe, blooming sweet peas and Bao. I took the teenage boy to see The Incredibles 2 and it was so, so, so good. I thought it was as great as the first one. And, there was an animated Pixar short film before the movie called Bao, about a boy and his mother, which made me cry. Not tear up but actual tears running down my face. Bao is generating a lot of buzz. Chuco’s Cumbia by Los Lobos has been one of the songs on my phone. I always like to listen to Latin music but especially so during the summer. It’s festive! I’ve been weeding, watering and waiting for flowers to bloom. I got all the dahlias in the ground and all but three or four have emerged from the earth. I hit a tag sale today and left with a several pieces of glassware for $3. I was happy. My haul included a Pyrex pie plate, a Pyrex 13 x 9 casserole, a tiny glass jar suitable for a flower vase and three glass bowls, somewhat wide and shallow suitable for floating candles or short-stemmed blossoms. Tell me what your favorites are this month.